Our second week in our 12-Week Late Harvest membership in Angelic Organics CSA included lots of tomatoes, a vibrant green pepper, and a beautiful eggplant. When grouped with our giant summer squash from our own organic container garden, making a Ratatouille for dinner one evening was a no brainer. 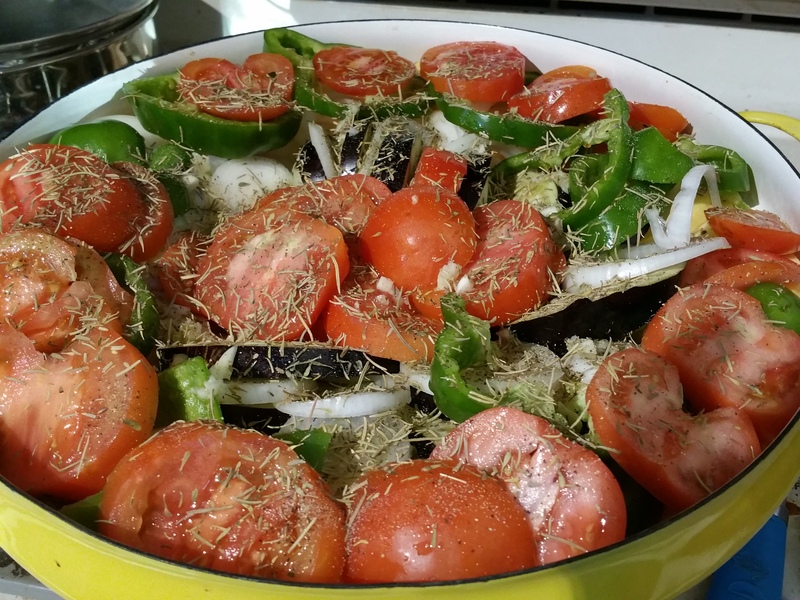 This ratatouille recipe is a bit different than traditional stove top recipes: it roasts in the oven. bly sacrilege but definitely an easy dish once all the vegetables are sliced. 1. Preheat oven to 350º F. Spray a large casserole dish with an oil spray, like Pam. I used my vintage yellow Dansk paella pan. It’s perfect for dishes like this. 2. Slice the vegetables and arrange in rows or in circles. I start with the larger veggies and work my way inward in circles. So, squash around the outside, with eggplant next in, etc. I place the onions between the eggplant slices and the green pepper rounds on top of everything. 3. Sprinkle minced garlic across all of the vegetables. 4. Drizzle a good amount of olive oil over all of the vegetables (maybe 1/4 c to 1/3 c). 5. Shake rosemary and thyme over the vegetables (about 1-2 Tbsp each, depending on your preference). Then add ground black pepper, again to taste. 6. Cover tightly with foil and back for 45 min. Remove foil, then back for another 30 min. Optional: serve over white or brown rice. Serves 5 when served over 1/2 c rice.